Iraq's prime minister assures an Italian minister the attackers will be "severely punished"
(CNN) -- Attackers gunned down an elderly Christian couple late Sunday inside their Baghdad home, the latest in a string of religious-rooted violence that has spurred international outcry and a full-court press for justice from Iraqi authorities. Cardinal Emmanuel Delly III -- the patriarch of Iraq's largest Christian community, the Chaldean Catholic Church -- urged Iraqi Christians in a televised address last month to "stand firm" within their country during these "difficult times." 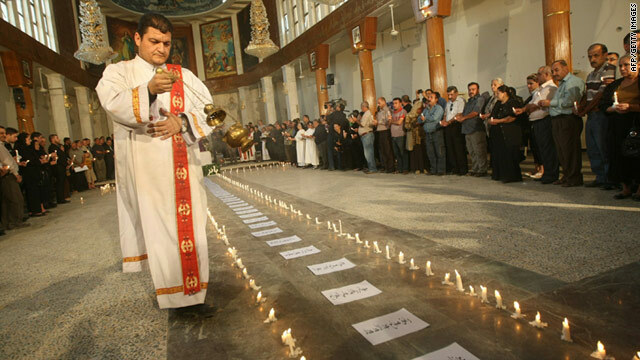 Frattini -- who also met this week with survivors of the church siege, as well as Cardinal Delly -- also said it was important that Christians felt secure in Iraq, and that they remained there.